Mark's Tickets is the best place to find tickets for Toronto Raptors fans. Just check this page for any new events or schedule updates throughout the year. We sell tickets to every Toronto Raptors game around the world. We know how passionate Toronto Raptors fans can be about basketball, so we make sure to have hundreds of tickets for every game available right up until it starts. For those looking for cheap Toronto Raptors tickets, we offer tickets starting at very low prices (many times below face value). 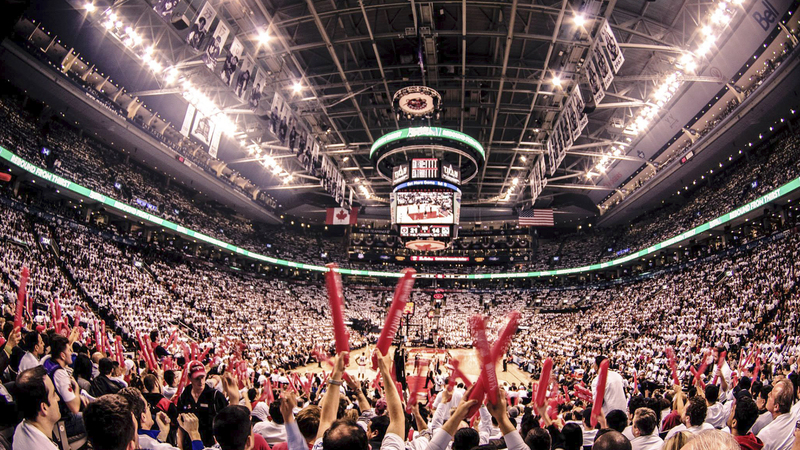 We offer tickets in most sections of every venue that you can see Toronto Raptors. Simply choose the city or venue that you are interested in below, and you will be able to see all of the available seats. Do not forget that Marks Tickets also specializes in sold out Toronto Raptors tickets. No longer will sold out shows prevent you from seeing Toronto Raptors. The Toronto Raptors are a professional basketball team that plays in the NBA. The Raptors play their home games at Air Canada Centre in Toronto, Ontario. With 82 games per year, and 41 being home games, The Toronto Raptors are a professional basketball team based in Toronto, Ontario. They are part of the Atlantic Division of the Eastern Conference in the National Basketball Association (NBA). The team was established in 1995, along with the Vancouver Grizzlies, as part of the NBA's expansion into Canada. When the Grizzlies relocated to Memphis, Tennessee, to become the Memphis Grizzlies in 2001, the Raptors became the only Canadian team in the NBA. They originally played their home games at the SkyDome, before moving to the Air Canada Centre in 1999. Like most expansion teams, the Raptors struggled in their early years, but after the acquisition of Vince Carter through a draft day trade in 1998, the team set league attendance records and made the NBA Playoffs in 2000, 2001, and 2002. Carter was instrumental in leading the team to a franchise high 47 wins and their first playoff series win in 2001, where they advanced to the Eastern Conference Semifinals. During the 2002?03 and 2003?04 seasons, they failed to make significant progress and he was traded in 2004 to the New Jersey Nets. After Carter left, Chris Bosh emerged as the team leader, but they continued to struggle. In Bryan Colangelo's first year as President and General Manager, the first overall NBA draft selection of Andrea Bargnani and a revamp of the roster, helped the Raptors qualify for their first playoff berth in five years and capture the 2007 Atlantic Division title with 47 wins. In the 2007?08 season, they advanced to the playoffs again but failed to make the next four playoffs. In a bid to persuade Bosh to stay, Colangelo overhauled the team roster for the 2009?10 season, but Bosh signed with the Miami Heat in July 2010, ushering in yet another era of rebuilding for the Raptors.